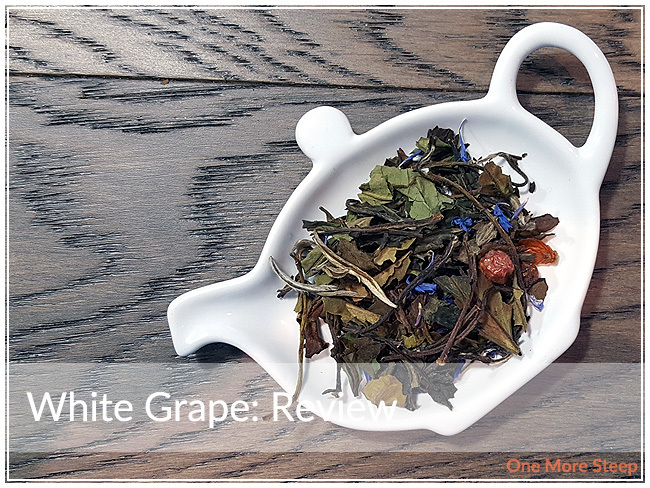 White Grape was one of my acquisitions at the 2017 Vancouver Tea Festival back in November, and it was one of the teas available to sample at ShakTea’s booth – so I knew I liked it before buying it. White Grape came to me in this small silver tin, the tea was in a plastic package inside of it prior to me opening it (I wound up pouring the dry leaf directly into the tin. This tea has a remarkable aroma – it’s floral, fruity – undeniably grape, with the pleasant fragrance of a light tea. It’s a very inviting aroma that this dry tea has. On the packaging, it states that White Grape consists of white tea and grape bits. 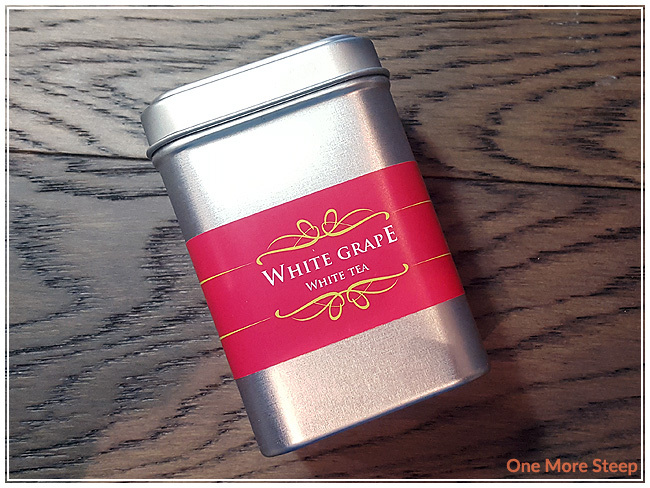 On the product page (at the time of writing), White Grape consists of: white grape flavour, rose hips, blackcurrant, mallow flavour, cornflower blossoms, and white tea. 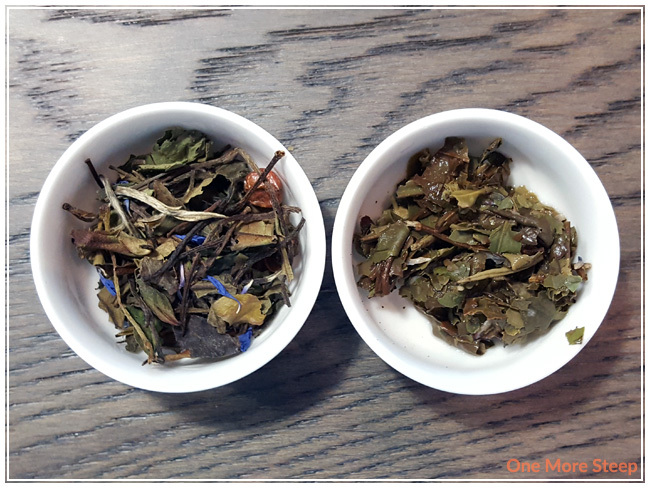 I’d say the latter is more accurate as I can very clearly see cornflower petals and blackcurrant in the white tea blend. I didn’t find any preparation recommendations on either the packaging or the website for this tea, so I steeped it at 185°F (85°C) for an initial 2 minutes. White Grape steeps to a very pale yellow. The aroma from the steeped tea is primarily that of sweetness and grapes. When I tasted the tea, I noted that the white tea base has some grassy flavours to it – thankfully smooth and not bitter when steeped for the 2 minutes that I did. Zero astringency was noted with this tea, and I happily continued to drink it. The grape flavour is sweet, and reminds me a lot of purple grapes (and thankfully not raisins) with just a touch of tartness. I found that the aroma of this tea kept me wanting to have more and more of it. I resteeped White Grape twice. I found for the first resteep, the flavours were still present, although a bit weaker. For the second resteep, the flavours were mostly waned and I was left with the white tea base flavour. To be fair, the grassy notes from the white tea are quite delicious so if you’re a white tea fan, you’ll still be able to enjoy the tea without the grape notes. I loved ShakTea’s White Grape. 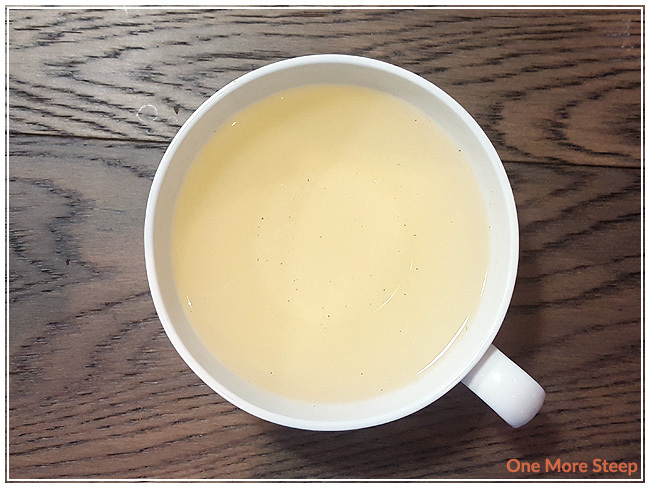 I really enjoyed this white tea when I first sampled it, and I was quite happy that I still liked it when I steeped it at home. 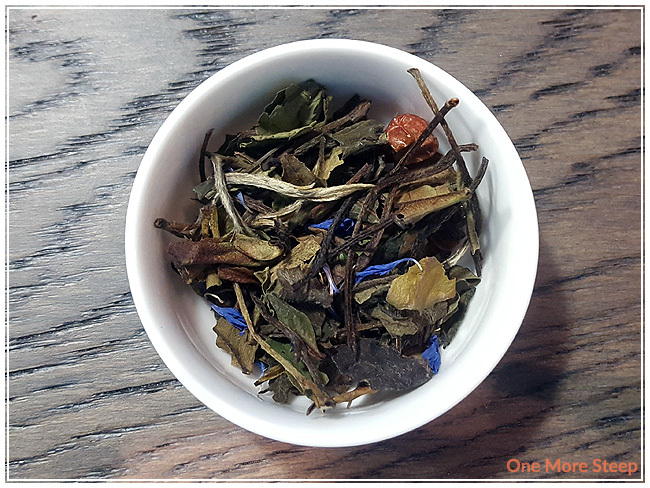 I just really enjoyed the mix of sweet and tart with the flavours that were blended in with the white tea, and the grassy notes were pleasant. As it is a white tea, I was quite cautious regarding burning or oversteeping the leaves, and was happy to find that it steeps nicely to a smooth, pleasant tea. I think the fruity flavour would lend itself well to being cold steeped or iced, as well as being paired with sweets.